I ate this thali and I went up the hill to Landour again. I wanted to check out the Language School. The Landour Language School is world famous, and is used heavily by the American Fulbright progam. Instruction is conducted in Hindi, Pashto, and Urdu. Classes are either one-on-one or conducted in at most three person groups. I have dreams of coming up here to learn Hindi and finish off a book sometime in the near future. Still - it's intimidating. Talking to people at the Four Shops can fill a fairly average person with profound insecurity. So many young genius-types finishing up dissertations on Pashto poetry, research on the growth of business in Hyderabad, researching ancient Mughal art. Degrees from Harvard and Yale and Oxford. Me? Uh. I write about stuff I ate a lot. I can say "good food!" in Hindi if I'm feeling sharp. I soon began talking to a small and extremely intense French woman. She was a photojournalist for some of the major news sources and had, of late, covered the Indian tsunami, Pakistani flooding, and a variety of assorted combat zones. For some reason, she took a shine to me. I asked her why she was at the school. "I need to learn enough Hindi to yell DON'T SHOOT, mostly," she said. We talked about travel, about my impending journalism career. To my relief, she seemed positive about it, or at leas t my odds of continued survival. As well as my idea of taking classes at the school. "Your breed....no, you're not the typical American. That's a good thing. Everything about you is quick, fast. It's your physiology. Sim, rapid eye movements. You seem very creative. You'll do well." "I feel like I'm not smart enough to be with these people," I said, making a vague gesture towards the school. "No, everyone's smart,in different ways. You know how to survive, and that's most important. Especially for a journalist - the quality of your work, okay, but the ability to survive, that's important. My paper sent us all up for military survival camp, recently. You should try it. You learn good things, useful things - if a gun is loaded, how to deal with political unrest, land mines, stuff like that. I didn't do chemical warfare though. Not this time." "You seem like you've made it as a journalist. It's really nice to hear all this from someone like you." "You say, "made it." That depends on how you define made it. I don't have two houses, or a ton of money, so to many people I haven't made it. But I'd rather be out here and seeing this huge world, I'd rather have that then two houses. So it's how you define "made it." She had to go off to class. I followed her and snuck around the school's interior for a bit. Looked lovely. Chatted with a few students who all had glowing things to say. It isn't even that expensive. Maybe I can someday convince a company to pay for it. Yeah, that'll be the day. I went for a walk since that's what you do in Mussorie. Landour really is a little-known and profoundly interesting UN of sorts. An Indian kid and an American kid from the Woodstock School, wandering up the hill behind me and arguing about video games. Bengali film stars (Hello, Victor Banerjee!). There were three young guys sitting at the Tip Top Tea Shop, drinking chai and finishing off their lunches. They looked American - something about the plaid shirts - and one way or another, we got to talking. "We're from Yale, all of us. I'm from Georgia, he's from Vermont, he's from Conneticut." Turns out one of the guys was the brother of a girl who attended Simon's Rock at the same time I did, the 300 person and very esoteric "early college" in the Berkshires. There's a tiny fraternity of Americans who travel and go abroad, who are comfortable there. I have stopped being amazed by the network, and by how interconnected we all seem to be. Almost every time I meet an American overseas, they know someone I know or are related to someone I know. In the most far-flung and small places, we share buoyant stories about the personality of So and So, or the time That Girl got wasted at a party and what she did after, or the particular qualities of restaurants and bars we both know and have frequented, and so on and so on. This is comforting, of course, but is also terrifically disconcerting. I think of it in terms of numbers. The USA has over 250 million people. India has over a billion. Why do we find each other? Why are we so interconnected? The answer, I think, lies in privilege. There are billions of people in the world, but only a vanishingly small number have the means to both receive a fancy education, finish the fancy education, and then find one's self with enough money and free-time to amble off into the wilds for a bona-fide and old school adventure. There are very few of us indeed, and we are the luckiest of the earth. No, I've stopped being shocked by how interconnected we all are. We are part of the same small and terrifically exclusive club, and we only grow aware of this gradually, and with some amount of embarrassment. We cannot pretend we live in a meritocracy. We are beneficiaries of an accident of birth. In the Karmic view, perhaps we were good and just people in our previous lives. But I am no Hindu. The lovely old church next to the Four Shops. And what were they doing up here? One of the guys was in fact a relative of Stephen Alter, one of the big-time writers who resides up here, and they were residing at his place. "We're doing fishing outfitting, up here in Uttarkhand. Trout and the local fish. Totally untapped market. Of course, the monsoon isn't helping." "I've always thought...you know, you could really sell these bhidis to hipsters." "They're cheap, they're foreign, and they taste awful. Hipsters would lap them up." "Yeah. They cost - what, a penny to make? You could get a shipload to the USA. Sell em' for three bucks a pack." "Of course, they mostly use child labor to make them. They're really tiny. Need tiny little hands." "Yeah, I hadn't considered that angle. Well. Kids need jobs too." "Yeah. You're helping the children!" They had to shove off down the road, so I sat and got out my sketchbook. Just about lunch time. I was trying to gain weight for my trek in Sikkim. Something about India seems to make me really skinny. I eat my brains out when I'm here, so not sure that it's *lack* of feeding. Thankfully, the Tip Top Tea Shop offers the perfect remedy in the form of twix bar pancakes. Normally the kind of food stuff this snob with a penchant for healthy eating would turn her nose up. But something about the elevation and the need to pack on a few pounds prior to walking 11 miles a day uphill converted me. I devoured these. This man is a pancake artist. Something about the sweet pancake, the crunchy rims on the side from the frying in butter, the oozing, delectable texture of the Twix bar lurking inside, how the cookie core gets all heated up. (This makes me sound like I am writing a dirty book. As does most food writing. I ate my pancakes and the proprietors father, who had owned the shop before him (Sheila knows him) came up and politely asked me if I would draw a picture of him. So I did. Drawing is a fabulous icebreaker. Victor Banerjee, the famous Bengali actor, came down here for his usual cup of tea and looked at me with what appeared to be extreme disapproval. Feel somewhat anointed. (I recall sitting next to him once in the internet cafe here and thinking about what a forceful typist he was. Like me, I admit). I went up to Landour again the next day. I walked around the hill again in lieu of anything better to do, and (naturally) I ran into Leon again. He had his video camera and was taping the trails. As always, he was more then happy to chat. I followed him for a while, a bit puppy-like I guess. "Ah, hey! Look over there," he said. He pointed at an old and falling apart house behind a gate, one I'd walked by a few times before and had never taken much notice of. "Okay, come over here. You can't go inside here, not anymore, but back when I was a boy - this is Peace Cottage. This is where we lived. It was a missionaries retreat for a long time. They'd send the old bird nuns up here to recuperate or go on vacation." The fog was moving in, and we could barely see the white structure beyond. It was diplidated and looked very old. I think the mist and the wet here ages things terribly quickly, and moves quickly when it comes to returning things to the earth, again. I peered through the gate - which wouldn't open - and thought of the scorpion cup and of the Partition. It was hard to imagine, this little white washed cottage with a mildew problem, living through all of this. But I could try. "The one thing I want to photograph. Okay. It's a false horizon. It only occurs in two places in the world - here, and somewhere in Switzerland. It's when there's literally a second horizon, and the sun even goes down behind it. I saw it once here, in my junior year. It was like - like God had driven a golden spike into the center of the world. I thought, "Oh my god, someone has to get a photo of this." So that's my mission. Of course, it's nature photography. What do you do? You stake out. And you wait. "I'll get it someday, I'm certain of it. Because, what does a good nature photographer spend most of his time doing?" We walked for a few minutes more. He pointed out some ferns to me that were going yellow. "That's not good. It means they're going to die soon, and my pictures won't be as good - not like I remembered it. They're dying earlier and earlier these days." We ran into some friends of his - some California boys with Indian family who were studying at the Language School. And so I asked him more about his life. He'd been an accountant before, and then his wife had passed, and then he'd given his house to his son and came here. But, the in-between. He was happy to oblige. "Well. After I left India, graduated, went to San Jose State for college. I played in a country western band in St. Helena. I taught music for a long time at San Jose state. Then I fell afoul of the administration, so I gave them the one fingered salute, and I went to Montana. I've done a lot of things in my life. I got married. I was a pumpkin, and she was a mouse. I was playing a Halloween party. That's how I met my wife. " He had mentioned his late wife the first time I had met him. But there hadn't been details. "We were going to come back here, for a Woodstock School reunion. To see the hills again. Then she got lung cancer, so we put it off for the next year. The year afte that, we wanted to go again, and then she was diagnosed with stage 4 lung cancer. One more year, and she seemed better, and we started planning again. Then, breast cancer. We decided we couldn't plan any trips together, because they caused cancer. She always had a good sense of humor, like that." "She didn't see the following year." We turned a corner and there they were, the snows. The sun was just thinking about going down, and the rain had washed away the clouds and the haze. I took as many pictures as I could. "My parents were missionaries, you know, and so I grew up an atheist in revolt." (The sun going through the pine-trees. If there be paradise on earth). I had my epiphany, as I remember. Before then I thought believing in God was a pretty silly thing. Then I'm out here, one night at Woodstock - i'm looking at the mountains, up at the stars, millions upon millions of them. And thinking, "Okay. Someone had to do this." "Take that as you will." "I agree," I said. And really meant it. This, the final allure and danger of the Himalaya. That it can turn you from a jaded and constantly irritated skeptic into an agape nature lover. Staring out at the view for days on end and gawping, and making comments about how astounding it all is. It does make you wonder, why humanity is so specifically programmed. That mountain ranges and marvelous vistas move us on such a primal, elemental state. The mountains, especially. Down in lowland Bengal or in Florida, in the Cambodian river delta or in the Australian desert - wherever there are no mountains, people keep pictures of them on their wall and dream of going someday. Indian Buddhists placed Mt. Meru, the center of the world, in the Himalaya. It is only befitting. Leon, too. A striking person. Another theme of this trip. Running into people whose spouses have passed, who have encountered an aspect of life I am too young to approach or know. A succession of them, all traveling after the deaths of their spouses, walking with no particular destination and talking to me because I am lucky. The references dropped in conversation are subtle and sad and make one consider the future, far-impending and far off This too myself in forty years or so, maybe, creaking and sleeping on budget-basement beds, thinking always of the person I have left irrevocably and inert behind me. Better then slipping into depression and inertia in a house full of mementos that gradually gather dust and cat piss. Better to go wandering again. 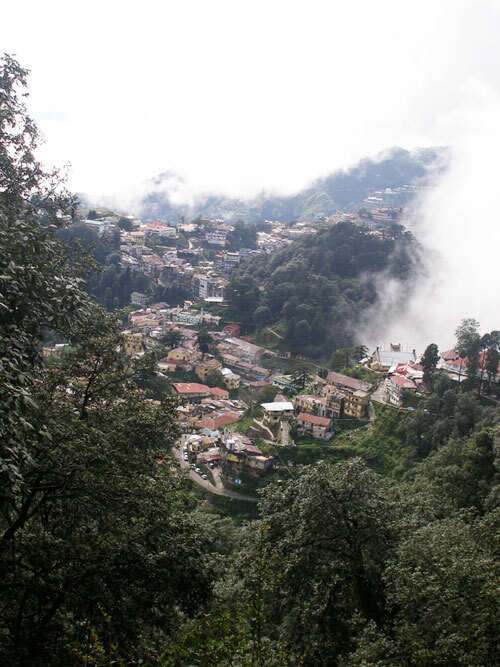 Landour is wonderful, and so is your write up.